Were you looking for Distracted Driving Car Accidents lawsuits? Auto accidents are one of the leading causes of injury and death in the United States, causing 3 million injuries and killing over 40,000 people per year. California car accidents are higher than the national average: thousands of auto accident fatalities occur each year in California for numerous reasons. 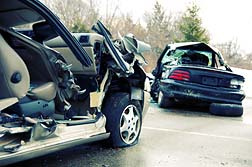 Send your California Car Accidents claim to a lawyer who will review your claim at NO COST or obligation. Nationwide, common causes for car accidents and injuries to occur are driver distraction or negligence; alcohol or drug related driving; defective vehicle parts, poor driving conditions or roads; congestion and higher traffic levels, and speeding. In California, traffic safety experts say a proliferation of unlicensed and uninsured California drivers contribute to a greater number of accidents, particularly hit-and-run accidents. California hit-and-run violations are considered a felony and convictions can mean a sentence to a state prison or county jail for up to one year and fines up to $10,000 or both. If the hit-and-run car accident causes a death or permanent, serious injury, those convicted face up to four years in a state prison, up to a year in a county jail, up to $10,000 in fines, or imprisonment and a fine. If the hit-and-run causes a car accident resulting in a death, a sentence of vehicular manslaughter punishment is extended for five more years. California motor vehicle law requires all drivers on California roadways to be insured. Uninsured motorists face arrest and/or a hefty citation; they could also lose their driving privileges and jobs and could even face deportation in some instances—especially if driving under the influence of alcohol or drugs. Some accident analysts and police speculate that California culture and roads account for more California auto accidents: drivers with high performance cars trying to run a red light are frequent causes of accidents. California's Compulsory Financial Responsibility Law regulates coverage requirements for automobile insurance. All drivers must show their ability to pay for damages or injury to others resulting from the ownership or operation of a motor vehicle. Comprehensive coverage (other than collision), uninsured motorist, medical payments and collision insurance are not required by law. All California drivers and owners must have at least the statutory limits of minimum liability insurance or an approved alternative way to pay for injury or property damage they may cause. Emotional and physical pain and suffering. If you bring a claim or lawsuit against another driver for injuries sustained in an automobile accident, you must prove that the other driver was negligent: it must be proven that the other driver failed to use that degree of care in operating his or her vehicle which would be required of a reasonably prudent driver under similar circumstances. Anyone involved in a California car accident who has suffered losses, damages, and injuries could be entitled to claim compensation if the accident was not their fault. However, proving fault in California can be difficult and it is advisable to seek advice from a California car accident lawyer if you believe that you have the right to make a claim. Jury Returns a Record $31.5 Million Verdict F..
December 15 Most Dangerous Day for California.. Ambassador to Malta Injured, Nun Killed in Ca.. I went from a strong active equestrian to completely disabled. I still suffer cognitive & memory issues, bowel & bladder control loss, greatly reduced strength & stamina, loss of balance & more.